Following on from the training session delivered by the Wilsons Family Team at the Haringey Law Centre on 16th November 2017, we provided a morning training session for Birth Companions, an incredible charity that helps pregnant women and new mothers caring for young babies. The support they provide is on a voluntary basis, free and an invaluable source of support to some of the most vulnerable women in society. Birth Companions started over 20 years ago by providing support for women when they went out from Holloway prison to the Whittington hospital to give birth. They supported many women who did not get a place on the Holloway MBU and were going back to the prison without their baby. They currently run weekly pregnancy and mother and baby groups in Bronzefield and Peterborough prisons and have recently started doing birth support. They also work with marginalised women giving birth in London. Women who are asylum seekers, are in Refuges, have mental health issues, are homeless- generally women are isolated and facing challenges. The referrals come from midwives and organisations working with women with complex needs. The volunteers and staff that attended the training have backgrounds related to supporting women in the perinatal period: student and retired midwives, doulas, antennal teachers, breastfeeding support. Others work/have worked with asylum seekers or women in prison. 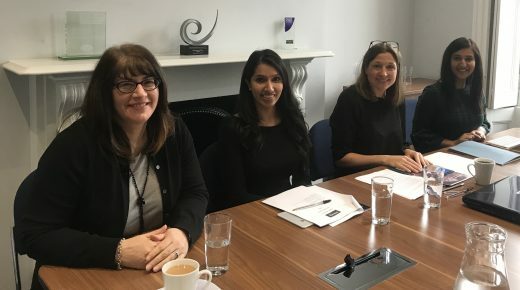 The panel of Solicitors from Wilsons consisted of three Children Panellists, Baljit Bains, Michelle Flynn and Juanita Kareer. The areas of training related briefly to private law family proceedings including domestic violence and protective orders, public funding (Legal Aid) and more substantially public law care proceedings including Child in Need, Child protection procedures, Public Law Outline meetings and Care Proceedings. The training was very relaxed with the opportunity for questions to be asked of the panel throughout. It was a very informative and interesting morning and Wilsons are looking forward to continuing to work with Birth Companions going forward to try and assist wherever possible to ensure vulnerable women’s rights are protected.